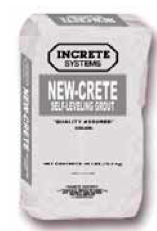 Looking to buy New-Crete Self-Leveling Grout by Increte Systems in Rochester NY, Ithaca NY and Western New York? With an A+ reputation for customer service and prompt pick-up and delivery, the Duke Company proudly carries the full line of Increte Stamped Concrete System products. Widely respected by decorative concrete professionals for ease of use and its self-leveling characteristics. Advanced engineering has created a polymer-midified, cementitious-based, single-component compound. Notably, the product should only be used on structurally sound interior concrete. Renown for excellent adhesion and quality. Its fast setting characteristics enable the surface to be able to be walked on in approximately 12 hours, and the surface being ready for staining in 24 hours. Commonly used with other Increte products including: Stain-Crete, Vibra-Stain Stone Essence and Concrete Stain. The Duke Company carries individual, 50 pound bags in White and Gray. Bulk and Pallets available for pick-up and delivery in Rochester NY and Ithaca NY.